1Cor 10:13 Three things to see here. •	First, Whatever temptation has come against us, it’s common to being human. •	Second, God will not let us be tempted beyond what we can bear. 	Doesn’t mean we won’t fail and give into temptation. •	Third, “The way out” has several components to it. 	And each of these components requires us to learn and grow in them. 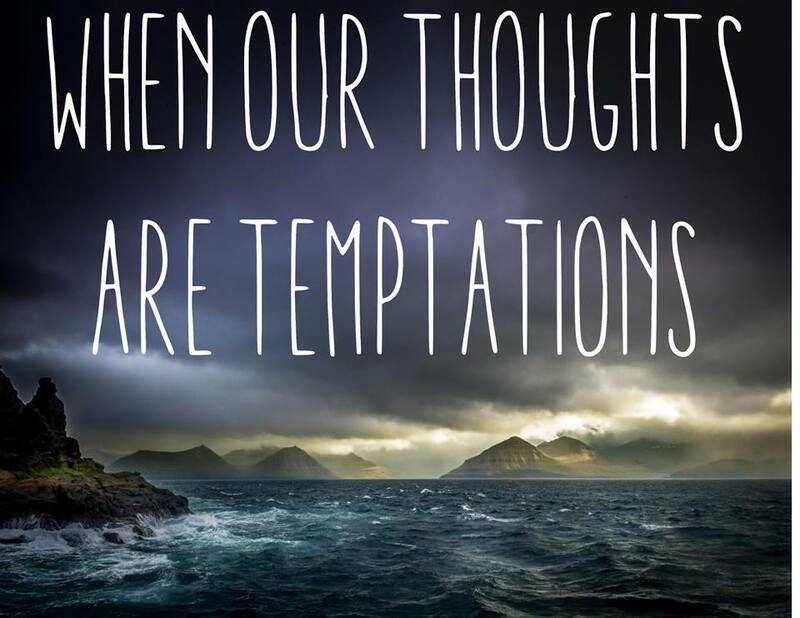 The book of proverbs: This is still all related to taking thoughts and temptations captive. •	The first 9 chapters of the book of proverbs present this interesting interchange between wisdom and folly. •	Both wisdom and folly are personified as a woman. Both calling and vying for our attention. •	The fact that both are personified as a woman is not a statement against women. o	It is merely a Hebrew poetry literary device. Verses 20-21 Wisdom is calling out to see who will pay attention. •	But there is competition because the streets are noisy with the clatter of day to day life. Verse 23 When we respond with acceptance to the wisdom of God, He then pours his heart into is. •	Wisdom must come first so that we can steward well the all the goodness that comes with his heart. •	He would have also made His thoughts known to us. Verses 24-33 These are the consequences of not responding to the call of wisdom. Chapter 2:1 Here we see that we are to accept wisdom. Verse 2 Now we move from accepting to applying. Wisdom also requires a heart level of application. Verse 3 Here we are also to seek out wisdom, just as wisdom was seeking us out. Verse 6 This tells us where wisdom comes from. From the Lord, from His mouth. •	This is not the wisdom of and from the world. •	Here we see this adulteress thinking, this collection of wrong thinking, is bowed down to death. Verse 6 Temptation is always looking for its prey. Verse 10 Temptation will always come either well-dressed or disguised. Verse 13 Temptation can leave the mind and become a physical reality, and hold nothing back. Verse 15 But temptation itself uses that pursuit as a seductive ploy. To try and make the prey feel good. Verse 19-20 Quickly following the invitation is an attempt at reason and coverup-excuses. Verse 21 Notice here temptation continues with the use of persuasive words and smooth talk. o	Its ultimate weapon is not the physical but with words, planted as thoughts in our minds. Verse 22 The Hebrew emphasizes the suddenness with which the prey falls and follows the temptation. •	But the outcome of that fall is quickly apparent, like an ox to slaughter. o	Reminiscent of the image of bowing down to death. •	The last part of the verse refers to being in fetters or stocks, as a form of discipline. So how does wisdom help us win war in our mind? o	As we have seen wisdom becomes our protection and our guard. 1. We must constantly be seeking wisdom, crying out for it. o	Pursuing it more than silver and gold. o	If you pursue wisdom, silver and gold follow. o	Or know better than Godly people who try to speak into our life. o	This place of acceptance come from that place of knowing Jesus, like a married couple know each other. b. And this leads to obedience. •	But again, this starts with the constant pursuit and crying out for wisdom. o	The more Godly wisdom we put into our mind the more it protects our mind and heart. •	Wisdom becomes that natural defense in our thought life. a.	James 1:5 If any of you lacks wisdom, he should ask God, who gives generously to all without finding fault, and it will be given to him. a. This concept is repeated over and over again in Proverbs.